The recycling police could be coming to Palm Beach County. After years of asking residents and businesses to voluntarily sort and set aside newspapers, cardboard, aluminum cans, plastic bottles and other recyclables, the county Solid Waste Authority is exploring shifting to mandatory recycling. Palm Beach County recycles about 30 percent of the waste produced by homes and businesses. State standards enacted in 2008 call for 75 percent recycling statewide by 2020. To boost Palm Beach County's recycling numbers, the Solid Waste Authority board — made up of the County Commission — on Wednesday directed its staffers to research and lay out the options for mandatory recycling. More recycling would cut down on the amount of trash dumped in the county landfill and burned in the waste-to-energy plant, said Commissioner Karen Marcus, who pushed for considering mandatory recycling. "There's a lot of people who aren't recycling," said Marcus, chairwoman of the Solid Waste Authority board. "It needs to become automatic. … Somehow, some way, we need to improve the system." It's an issue Solid Waste Authority officials said they considered before, but never acted on because of questions about how to force people to recycle. "How do you know? … Is someone going to go around looking in trash cans?" asked Dan Pellowitz, the Solid Waste Authority's assistant to the executive director. "There are obvious enforcement issues." Alachua, Sarasota and Collier counties are among the few in Florida that in recent years have tried mandatory recycling rules, at least for businesses and apartment complexes. Some cities, including Weston and Cooper City, made recycling mandatory as well — though enforcement of the rules remains lax. Getting to the state's 75 percent recycling goal requires more counties and communities to try mandatory recycling or take other steps such as expanding the types of items that can be recycled, said Dwight Adams, who heads the Sierra Club's Waste Minimization Committee in Florida. Short of requiring recycling, Palm Beach County and others could raise trash disposal fees to give businesses and residents a monetary reason to fill those blue and yellow recycling bins. "Pay-as-you-throw rates — the more you throw out, the higher your garbage rates are," Adams said. "It's going to require moving quite a bit beyond recycling as we now see it." Palm Beach County has long relied on a public outreach program to boost its voluntary recycling efforts. The Solid Waste Authority spends more than $300,000 a year on television commercials, other ads and school programs, reminding residents, students and businesses about what can be recycled. The authority delivers recycling bins to residents and sends representatives to businesses to discuss ways to incorporate recycling into their operations. "We try to make recycling as easy as possible for our customers," said John Archambo, the authority's recycling director. Palm Beach County's effort to meet the state's future 75 percent goal got a boost this year with state legislation that allows more incinerated materials at waste-to-energy plants to count toward the recycling standard. The Solid Waste Authority is in the midst of a $200 million refurbishment of its waste-to-energy plant and is planning a $700 million expansion of the trash-burning facility near the county's landfill in West Palm Beach. The authority projects it would meet the 75 percent state recycling goal by factoring in more of the burned waste. While environmentalists supported the 75 percent goal, many object to categorizing burning trash as recycling. "You are burning material that could be recycled," Adams said. "That is counter to the nature of recycling." Business leaders statewide have bristled at requiring more recycling. Mandatory recycling "doesn't work" and adds to costs for local governments and, by extension, businesses and taxpayers, said Keyna Cory, Senior Lobbyist for Associated Industries of Florida. "Who pays for that disposal? It's not free," Cory said. "That comes off the back of businesses." According to the Solid Waste Authority, local businesses generate about half of the 1.4 million tons of waste the county produces each year and much of that includes cardboard and paper that could be recycled. The Solid Waste Authority would need county government's help to enforce mandatory recycling, Pellowitz said. That could add to code-enforcement costs at a time when the County Commission is considering a property tax rate increase and spending cuts to avoid a $100 million shortfall blamed on the struggling economy. A report to the Solid Waste Authority board about the possibilities of pursuing mandatory recycling is expected in November. Because of the difficulty of enforcement, County Commissioner Steven Abrams said, he prefers considering more recycling incentives, not necessarily mandates, for businesses and residents. "It is intrusive for government to be going through people's garbage," Abrams said. "How far you go is the question." By Jim Johnson — They would have settled for seven, would have made budget at 12 and had a goal of 25. And when the a total of 39 contestants entered a first-of-its-kind trash cart decorating contest sponsored by the Women’s Council of the Environmental Industry Associations, members of the group were ecstatic. 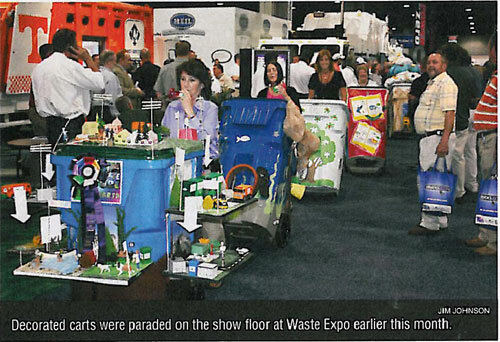 The inaugural event, dubbed Carts on Parade, was held at Waste Expo in Atlanta recently. The effort raised about $20,000 for the Women’s Council, which will use that money to help provide college scholarships for students and continuing education for both men and women working in the waste industry. A push by Women’s Council member Keyna Cory resulted in 12 carts coming out of Florida alone when she was able to pair up two of her client bases. Cory, the President of Public Affairs Consultants in Tallahassee, Fla., works with solid waste companies as a chapter lobbyist for the National Solid Wastes Management Association and with the Florida Alliance of Boys & Girls Clubs. “It’s been a great project and they just loved doing it,” Cory said. 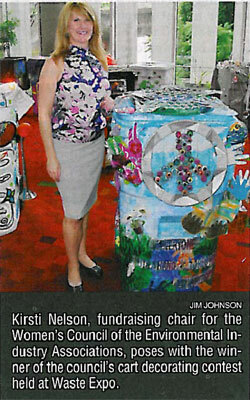 Florida companies sponsored the carts — which were donated by Otto Environmental Systems North America Inc. — and children from the clubs decorated them. While Otto donated the 95-gallon carts, there was a $600 fee to enter the competition. That fee put the funds in the fundraiser. This being the first year of the program, there were some questions about how the idea would be accepted. “It blew us away because we didn’t know how this was going to go,” Macenas said. Most of the carts, but not all, were donated by Otto. Other cart manufacturing companies were able to enter their own products. First place went to a cart decorated by the Jim and Jan Moran Boys & Girls Club of Deerfield Beach, Fla., and sponsored by Southern Waste System LLC. Second place went to a cart decorated by Jennifer Gravelle and sponsored by Big Truck Rental. Third place went to a cart decorated by Maria Stramel, Jimmy Rimsa and Hubert Gutierrez and sponsored by Perkins Manufacturing. By GRACE GAGLIANO and SARA KENNEDY, MANATEE — Some local companies are rooting for measures under consideration in the Florida Legislature meant to preserve boatyards and marinas that dot state waterways. House Bill 7127 and its Senate counterparts would set guidelines to be used by property appraisers in determining how to assess “working waterfront property,” according to a House staff analysis of the measure. It would also implement terms of a constitutional amendment passed in 2008. “Reducing taxes just makes it easier to keep your bottom line strong, and reduces the burden of operating a business in Florida in a tough economy,” she added. Another local anxious for passage of the measure is Gary Alderman, vice president of Palmetto’s Snead Island Boat Works, Inc.
State Sen. Mike Bennett, R-Bradenton, said he favors the measure, working its way through both chambers. “We’ve got to do something,” Bennett said Tuesday. In 2008, voters overwhelmingly approved a constitutional amendment after people like bait shop or marina owners complained they were hit with outsized property tax increases because they were near waterfront high-rise condos or waterfront resorts, said Keyna Cory, coordinator for Save Our Waterfronts and a senior lobbyist for Associated Industries of Florida. Under the terms of bills now being considered, if a business qualified as a “working waterfront” property, it would be assessed on the basis of “current use,” and not on “highest and best use,” which would help marine businesses, she said. Among properties that may be classified as “working waterfront” are marinas and drystacks open to the public; marine manufacturing facilities, and commercial fishing facilities among others, according to the House staff analysis. The House bill is key in making the state more business-friendly for marine-related operations, said Frank Herhold, executive director of the Marine Industries Association of Florida. LobbyTools.com, Bruce Ritchie, 04/12/2010 - Two groups that have raised concerns about a "mega-water" water bill introduced by Sen. Lee Constantine have announced their plans to hold a water forum in June. Associated Industries of Florida (AIF) and the Florida Section of the American Water Works Association (AWWA) have announced they are holding the first "Florida Water Forum" on June 4 in Orlando. They have asked candidates for governor and agriculture to attend and participate in the forum. "What we want to make sure is Florida is going to be strong on its water polices from now moving forward, taking care not only of our needs now but planning for future growth," AIF senior lobbyist Keyna Cory said. Both AIF and AWWA have been active on water issues in the Legislature and have raised concerns about SB 550 by Constantine, R-Altamonte Springs and chairman of the Senate Committee on Environmental Preservation and Conservation. AIF is concerned that a provision in the bill that would create septic tank utilities amounts to creating another layer of government, Cory said. Constantine said establishing septic tank utilities would protect people from having to pay $6,000 or more when their septic tanks fail. AWWA wants a "clean" rewrite of state water law in the Senate bill to match House bills, Florida Section lobbyist Doug Mann told the Senate Government Oversight and Accountability Committee meeting last week. SB 550 has three more committee stops before it reaches the Senate floor. By Kevin Spear, Orlando Sentinel — State Sen. Lee Constantine's longtime goal of dramatically boosting the recycling of Florida's 32 million tons a year of trash is gaining momentum. The Altamonte Springs Republican's legislation, Senate Bill 570, calls for a statewide recycling rate of 40 percent by 2012, 50 percent by 2014, 60 percent by 2016, 70 percent by 2018 and 75 percent by 2020. The state already has difficulty meeting its current goal of recycling 30 percent of the debris and trash that otherwise wind up in landfills. "We are woefully behind other states," Constantine said Wednesday during a Tallahassee workshop of the Senate Environmental Preservation and Conservation Committee, which approved the bill after it drew generally favorable support from industry, environmental and government representatives at the gathering. Environmental groups such as the Sierra Club have been enthusiastic about the senator's push for more aggressive recycling, an effort he began in 2007 as part of a broader quest for energy conservation. But Dwight Adams, who wasn't at the workshop but is chairman of Sierra's Waste Minimization Campaign, said the bill "doesn't have what it takes to get there," including not enough emphasis on composting food scraps and yard waste. Associated Industries of Florida supports a recycling bill "that moves Florida into the next era," association lobbyist Keyna Cory said in a phone interview. Her business group backs provisions that would boost the market for recycled goods, though it is concerned that a mandatory reporting requirement for businesses with 25 or more employees would be too much of a burden. Debbie Sponsler of Orange County's Solid Waste Division said she is worried about whether there will be sufficient demand for recycled items because "I want stuff leaving here and not piling up." The bill filed by Constantine, chairman of the environmental committee, also calls for mandatory recycling at businesses, apartments and condominiums that open after the bill becomes law; creation of a Recycling Business Assistance Center to encourage markets for recycled goods; and mandatory recycling of construction and demolition debris. Several aspects of the legislation are mirrored in a variety of House bills. Not part of Constantine's bill: provisions for curtailing use of plastic and paper shopping bags. The state Department of Environmental Protection proposed a phased-in ban of such single-use bags but then retreated recently from the recommendation. By Michael Peltier, The News Service of Florida, The Capital, Tallahassee, Jan. 21, 2010... A Senate panel charged with carrying out a constitutional amendment to protect working waterfronts made last-minute changes Thursday to expand the amendment’s scope and protect it from likely legal challenges from local cash-strapped local governments. The Senate Finance and Tax Committee gave unanimous approval to the bill (SB 7026), which implements Amendment 6. The amendment was passed by voters in 2008 and provides property tax protections for marinas, public launches, marine manufacturers and commercial fishing operations. The panel voted to expand the reach of the amendment by adding waterfront facilities that provide transportation of goods and people, specifically providing tax protections for businesses in towing, storage and salvage services. “We’re trying to craft a statutory proposal that includes as many intended uses as possible to ensure that the intent of the constitutional amendment is met,” Sen. Thad Altman, R-Melbourne, told the News Service of Florida. But the issue is likely to raise the ire of cities and counties, which rely on property taxes for much of their revenue. As approved, the amendment restricts the valuation of qualified properties for local tax purposes. Without the latest change, a 2009 staff analysis estimated that it would reduce local tax collections by $46.9 million for the 2010/11 fiscal year. Senate staff said Thursday the changes would likely increase that figure. Revenue estimators are scheduled to review the proposal in the next couple weeks. Down the road, Altman said he would like to include other businesses that also provide waterfront access but may not fit the rigid boundaries set forth in the constitutional language, such as party boat operators and dry land storage facilities. “We’re going somewhere beyond the precise language but are well within the clear intent of the language,” Altman said. In anticipation of possible legal challenges, Sen. Mike Bennett, R-Bradenton, added a late amendment that would allow the measure to remain law if particular provisions were successfully challenged in court. Keyna Cory, a lobbyist representing Save Our Waterfronts, said a coalition of business groups including Associated Industries of Florida supports the measure with or without the changes made Thursday. She also acknowledged that legal challenges may ensue depending on the bill’s final version. “We support Sen. Bennett’s action to ensure that if one part of the measure is thrown out the rest of it can continue,” Cory said. Among those who benefit are businesses that provide shallow draft cargo and passenger services located on the Miami River. The river is home to 32 privately owned terminals that provide port and marina services for smaller vessels. By volume, it’s the state’s fifth largest port, according to the Miami River Marine Group, a trade association representing the business. On Thursday, the group’s executive director Fran Bohnzack said Miami River businesses are expected to gear up as Haitian relief efforts grow. With lack of deep port access in Port Au Prince, cargo and relief efforts must rely on shallow haul transportation, the kind businesses along the river have provided for years. “We will be busy for at least a decade to come,” Bohnzack told committee members. BUSINESS SAYS NO MANDATES ... Business groups said Thursday that Florida should not impose any new mandates in order to meet a 75 percent recycling goal. The Legislature in 2008 adopted a comprehensive energy bill that established the 75-percent recycling goal. Florida Department of Environmental Protection recommendations for reaching the goal include requiring recycling at all construction-waste landfills. Members of three House councils that met together generally praised a DEP representative for her presentation on the report and asked how markets for recyclable materials could be expanded. Keyna Cory, chief lobbyist for Associated Industries of Florida, told the legislators the group supported most of the DEP recommendations. But she and representatives of the Florida Retail Federation and the waste-management industry offered numerous examples of companies, such as Wal-Mart, that are recycling and using recycled products. "Once again, without any mandates," Cory said.